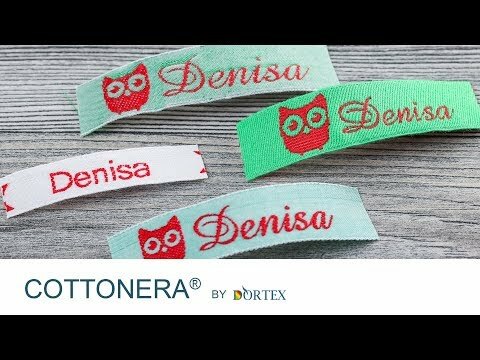 Cottonera woven labels and name tapes have many uses. From the traditional laundry label to labels for your own handmade creations: They are always in two colors and you can order them in your desired length, choose between the sew-on or the iron-on version and much more. With our extremely precise configuration tool, your finished woven labels will be delivered to your door just as you imagined them. Good to know: Since all Cottonera labels are 100% cotton, the ends of the woven labels cannot be hot-sealed. Cottonera woven labels must thus always be turned under to sew into place to ensure that they do not fray. We automatically add an appropriately wide edge to both sides; you don't need to worry about it. More lines of text desired? The one-off logo set-up fee for our Cottonera and Polynera products costs $23.95. You can use the logo for Cottonera and Polynera when re-ordering. Once you have configured and uploaded your logo, make a note of the logo code, to enable you to open it up again at any time, or to show your friends. If you are logged in, your logo will of course be saved automatically. After an initial order with this logo code, your uploaded logo is marked as having been paid for. Re-ordering without changing the image cut-out is possible for all woven labels, in all widths and color combinations. If you have already registered with us, please log in. Then you can view all of your logos and select one of them. You must first log in or upload a logo to see existing logos. Overnight production: If you order until 12:00 a.m. tomorrow, production and shipping as a goods letter will take place tomorrow (2019-04-24). Express production: If you order until Wednesday, 2019-04-24 12:00 o'clock,, your labels will be woven and sent as a goods letter until (Friday, 2019-04-26). Express production: If you order until Wednesday, 2019-04-24 12:00 o'clock,, your labels will be woven and sent as a goods letter until (Monday, 2019-04-29). If it simply must be a fast turnover, we offer Cottonera woven labels in the widths 10mm and 15mm in the high-speed versions: If you order by 12:00 midday, we can send your labels on the same day. Your labels slide off the loom directly into the envelope. Cottonera Basic woven labels are only available in the 10mm width with a red font on a white background. This is the most frequently ordered version of our cotton labels and we are able to offer it at a particularly low price. There is only one font available and no motifs, but you can choose whether you want them in the sew-on or iron-on version. These are usually used as the typical name labels to mark clothing. But they also work well as retro labels for handmade items. Cottonera Classic labels are the perfect beginner label for anyone who wishes to label handmade items in an attractive and low cost way. Weaving on the shuttle loom gives the Classic labels their particularly attractive structure. Select from widths of 10mm, 15mm and 25mm, various background and font colors and whether you want the sew-on or iron-on version. You can use our fonts and motifs or upload your own logo. Cottonera Premium combines modern weaving technology with 100% cotton. Our top product in cotton is woven in widths of 15 and 25mm. You can choose from strong background and font colors, use our fonts and motifs or upload your own logo. You can cut and fold the labels by yourself or we will do the cutting and folding on your behalf. Always a matching label for your fabric: Order your labels in our harmonious color sets. No desire to sew? Your labels can be affixed in seconds using our patented nameFIX .